Warning: my voice sounds awful thanks to the cold i’ve been fighting all week. ugh. you can find a photo tour of my craft room here. i have some awesome new christmas crafts planned for this week, so swing by and check out the new tutorials i’ll be posting! 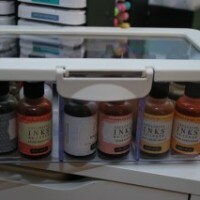 disclosure: i received free products from The Original Scrapbox for my craft room. all opinions are 100% my own. Can I move in??? It’s so amazing! WOW ! I like the folding cabinets! Great! I’m seriously dying over this room. Are you kidding me, it’s gorgeous. I cant believe how much craft stuff you have. You most definitely needed that room!!!! Great job, girl!!! those scrapboxes are amazing! the room looks so beautiful! great job! LOVE it! It’s so fun to see a person “in real life” :-) You’re adorable. Thanks for sharing! and for even showing the unorganized closet. That makes us all not feel so bad. LOVE those craft boxes! And great idea to wind all your loose ribbon on chip board! I can’t believe I didn’t think of that already! Beyond fabulous!! I’m even more jealous know than when I just saw the photos. ;) All of that storage! No matter what I do, I just can never get enough storage. I love it, Linda! Oh My !!!! I want to go there :) I love this room, my husband would help me put together a craft room but I think he is afraid I would never leave it !!!!!! Our only child, our daughter, is away at college( four hours away) and we are I guess empty nesters so I think he might be right !! It’s beautiful and very inspiring, I can’t wait to see the things you create !! That is yr best craft room anybody could won’t and I really have a won’t . That is gorgeous!!! How fun is that room!! How long did it take you to do all of this? I especially love your idea for fabrics and ribbons, I hate that I have all my fabric and ribbons stuffed in moving boxes! Lovely, you have real talent! That is the most amazing craft room I’ve ever seen. Hope you get to feeling better soon. I have one of the scrap boxes and I love it because it seems to get so much stuff “up” and out of the way. Your craft room is beautiful. Thanks for sharing. thanks, becca! miss you!! i’ll tell davis you approve of the video ;) ps did the sound on the vid work for you? everyone keeps telling me they can’t hear a thing…. 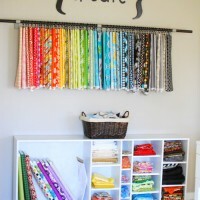 I am wide eyed and drooling over your craft room! Love the wall paper, lighting and storage – just wonderful!! 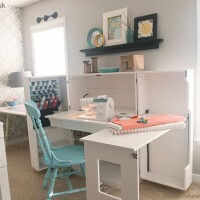 I am swooning over your craft room! I just love all of the great storage & organization you have. Someday I will have a room like that too (fingers crossed). The video came out great too – you’re adorable :) Thanks for sharing & inspiring! That is beautiful! I lovelovelove those crafting “boxes, wish I could have some of them. But seeing as my whole living area is as big as your craftroom I’ll just have to wait :) I’m in a totally organizing-mood so this was real inspiring, thank you so much for charing. I’m in love! I had a hard time hearing you so maybe you said this, but did someone make all of your cabinets & sewing table? Definitely bookmarking this one! So sorry about the sound! Not sure how to fix that. I think I’m the only one that can hear myself talking in it lol Anyways, the storage boxes are made by TheOriginalScrapbox.com. They rock! Great vidoe. It is always better than just blogging. I am envious of all the crafting cabinets. Linda-I have to tell you, you are one of my favorite bloggers on the net! You seem so genuine on your blog, and after hearing your voice and seeing your video, I can see it’s true! Love the room and Davis DOES have mad video skills! So amazing people can make a living from the internet….I think it’s fantastic and wish you guys continued success. :) Have a blast in your room, and can’t wait to see the Christmas projects! This has got to be my dream crafting room!!! I usually sew on the dining table and keep everything in the cupboard when I’m done…. Wow, I’ve got some serious Scrap Box envy! Those units are fantastic! WOW what an amazing craft room. I cant imagine owning that many products from the Scrapbox. I would be happy with just one of them!! Great craft room!!! Such a great space…I wouldn’t want to leave! Love the color scheme with all the bright white. Definitely would put me in a creative mood just walking in! OMGoodness … what a beautiful craft room. Such inspiration to get my craft room organized. Thank you for sharing. Lucky girl! It’s perfect and you’ve thought of everything! Linda, I just found you through a google search and had to tell you this room is AMAZING!! Lucky you to have such wonderful furniture to create/organize with. Thank you for the inspiration! OH- M-GEE!!!!! I LOVE your room. I have always wanted to own TheOriginalScrapbox and you have them all lucky you. Just surfing and came upon your blog, really happy I did. Thanks for shareing your awesome space. You are absolutely ADORABLE!!!! Love, love, love your craft room! I am amazed you still have more space to put stuff (cubbies under craft cabinet, closet) My scrap room is a horror! It’s jam packed from head to toe. No wonder you make such beautiful things in that beautiful room. I have no idea how I happened upon your blog originally but I am happy I did. Thank you for all the great tuts and sharing your crafty life with us! I really really love it!!! How much did you spend?? Hi! Nice tour, thank you! Can you share what size the room is that you use as your craft room? Visiting from iheart organizing… WOW!! I’m not a “crafter”… more like a wannabe! But, I can totally see some homeschool storage ideas here! Love your space!! Thanks for sharing the video, too. Thank you, Paula! I’m so glad you stopped by! I hope you can use some of my ideas in your home! Where did you get this walpaper? It is actually stenciled with a Royal Design Studios stencil. Thanks for stopping by! What a lucky gal! I want want want!!!! Wish I could come over to play =) Can we make a play date?? Wonderful/Beautiful craft room. I am hoping in the future to purchase the scrapbox craftbox, sewing maching box and ez view craft table. Thank you for the video! Loved it!! Wow! I am speechless and amazed with the talent you have for creating such a wonderful craft room! I would love to have my basement transformed to looking like your room! Unfortunately, we have no extra money to do any renovations or improvements so I have my late 60’s dark paneling and popcorn walls with boxes of crafts thrown around everywhere! ugh! I homeschool so we have glue, paints, canvas, construction papers, etc all over the room…along with my soap making supplies and sewing machine. Thank you so much! Sounds like your homeschool/craft room gets a lot of use! That’s great! Thanks for stopping by! Hi Linda, Just love your Craft room and projects, it’s stunning. i’m from South Africa and just bought the cameo. I don’t know anything about the cameo and so badly want to know its ins and outs. Where can i get online classes for the cameo? Congrats on the new Cameo!! I posted this question to my Facebook page this morning here: https://www.facebook.com/CraftaholicsAnonymous/posts/10151201061530993 Hope this helps! Love your craft room! Thanks for showing the Scrapbox line in use. I just discovered the Scrapbox yesterday and literally squealed when I I saw how neat and organized it is! 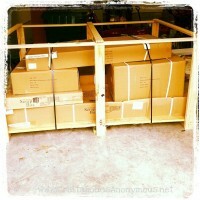 WOW, those are the ULTIMATE crafter’s organizers! How in the world did you receive FREE products from them??? P.S. LOVE your old bed frame thing as a pin board! It’s so clean in and fresh in there! And I love how your wallpaper is grey to allow the vibrant colors of your fabric and ribbon really pop! I’m so glad you stopped by and said hi! The Original Scrapbox has AMAZING products! Honestly, I just really lucked out! Once in a life time opportunity, for sure! Hope you’ll stop by again soon! I want to work in that room. What an incredible design! Bravo!!! I love your craft room, mine is a current work in progress. You really gave me some great tips. I’m trying to get things moved around and out of my space. I would love to have some of your storage, it’s amazing. I need to sit down with my husband and show him your tour. I hope he can figure out a way to add some of the storage units you have. Thanks so much. I know this was a few years ago, you posted on my birthday (LOL) Once again thanks so so much!!!! Hi Linda-I just watched the tour video of your craft room and it is beautiful!! What a great way you have utilized the space. I am in the middle of trying to plan my out of control craft room and you have really inspired a lot of idea for me.Thank you for sharing! Thanks, Kelly! Love that quote by Elder Uchtdorf! Thanks for stopping by! Love your craft room! Love all your cabinets and your desk. Best craft room that I have seen. Would love to know where you purchased the sewing cabinet?